Help the flowers throughout your garden grow upright using the Panacea Semi-Circular Plant Support. This sturdy and convenient unit easily surrounds half of a medium shrub or other plant, with its 8" diameter top arc. 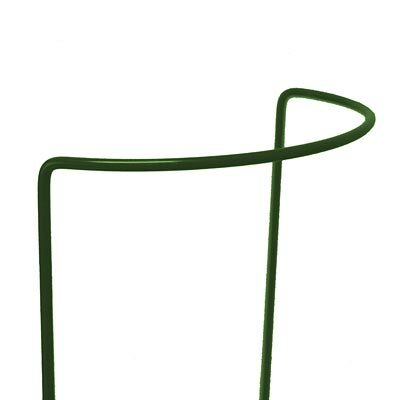 This metal support helps distribute the plant's weight, assisting the roots in growing strong and remaining viable. The two, 22" long stakes insert into soil easily, and the green color of the unit blends with your plant. Its metal construction and plastic coating remain durable for seasons of faithful use. Keep your favorite flowers healthy and growing upright with this Semi-Circular Plant Support. Made in the USA. Note: This case pack includes 25 of the Panacea Semi-Circular Plant Supports, 8" x 22".